As professional shippers of fine art, we specialize in shipping and packing art, antiques, and a whole range of other valuables both nationally and internationally. Our expertise and knowledge allow us to work with many art business professionals, from dealers to galleries and auction houses. However, if you are new to the complicated process of art transportation, you may have many questions about art shipping services provided by specialized companies like Fine Art Shippers. For example, do you know what freight shipping is? If not, this blog post is right for you! First of all, let’s start with the definition! Freight is the general term used for cargo, goods, and commodities transported from point A to point B by truck, train, plane, or ship. 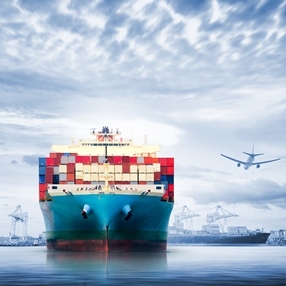 Thereby, freight shipping is the process of transporting freight by land, air, or sea. Moreover, in addition to the transportation itself, this crucial process also includes paperwork, scheduling, organizing, and proper handling, especially when it comes to shipping different fragile items like art and antiques. FTL (full truckload) – transportation of bulk items that are large enough (typically more than 15,000 pounds) to fill a full truckload. LTL (less than truckload) – transportation of items that are larger than parcel but do not require the space of the entire truck (something between 150 and 15,000 pounds). Partial truckload– a very popular mode of freight shipping, which is designed for middle-sized shipments that do not require a full truckload trailer. Besides, partial truckload gives the option to save money by splitting the cost of a truck with other shippers. Intermodal freight shipping – transportation of freight with a combination of different modes of transport. For example, intermodal freight shipping may involve rail, truck, and ship to streamline the transportation process. Expedited freight shipping – this type of freight shipping usually refers to transporting cargo by air as it is the fastest way to deliver items to anywhere in the world. At Fine Art Shippers, we offer all types of freight shipping to meet the needs of our clients. So whether it comes to moving a single painting by a renowned artist or shipping the whole estate, feel free to contact our team! Moreover, our local and international freight shipping services are all reasonably priced so that you are sure to stay within your budget.